To isolate DNA from fish fins. To obtain the purified form of DNA which can be further used for molecular analysis. To understand the principle and process of DNA extraction. Deoxyribonucleic acid (DNA) is a complex nucleic acid containing the genetic code with the instructions for the development and functioning of all known living organisms, with the exception of some viruses. The DNA segments that carry this genetic information are called genes. DNA is transcribed into RNA which is then used as a template in the synthesis of proteins. DNA isolation refers to the process of extracting DNA from a cell in a pure form. The extraction of DNA is an important preliminary step in which purified DNA is obtained from other cellular components such as proteins, RNA and lipids. DNA can be isolated from any nucleated cell from diverse sources, both living and dead, such as whole blood, hair, sperm, bones, nails, tissues, faeces, shed feathers, egg shells, saliva, epithelial cells, urine, bacteria, animal tissues or plants. Isolation of DNA is required for a variety of applications in science, medicine and forensics. For example, scientists introduce DNA into the cells of animals or plants for SNP analysis, DNA methylation analysis, copy number variation (CNV) or comparative genomic hybridization (CGH) analysis, Southern Blotting, PCR etc. In medicine, DNA isolation is helpful for diagnostic purposes. Furthermore, DNA extraction is an important tool in forensic science for the identification of individuals (for example rapists, thieves, accident, or war victims), paternity determination, body identification etc. There are a number of different procedures for the preparation of genomic DNA. They all start with some form of cell lysis, followed by deproteination and recovery of DNA. The main differences between various approaches lie in the extent of deproteination and in molecular weight of the DNA produced. Factors affecting the methods of DNA isolation are the age,source,and size of the sample. The presence of proteins, lipids, polysaccharides etc. during DNA preparation can interfere with DNA analysis methods by reducing the quality of DNA. The extraction methods to efficiently purify DNA from various sources have to be adapted depending on factors such as sample size, the freshness of the sample, and the biochemical content of the cells from which DNA is being extracted. The isolation method must vary depending on the size of sample. The freshness of the sample also affects the extraction technique. Extraction methods are also variable according to the biochemical content of the source cells. For example, in the case of bacteria, the main biochemicals present in a cell extract are protein, DNA and RNA. Therefore, phenol extraction or protease treatment, followed by removal of RNA with ribonuclease, leaves a pure DNA sample. These treatments may not be sufficient if the cells also contain significant quantities of other biochemicals. Plant tissues are particularly difficult in this respect as they often contain large amounts of carbohydrates that are not removed by phenol extraction. Fish fins are an excellent and reliable source of high quality DNA with a number of advantages. In most cases DNA is obtained from the collection of blood from the fish. In the case of rare or endangered species, this method is not advisable. Therefore, fin tissue is often used for DNA extraction because sampling is relatively fast, logistically simple, and is non-lethal. A small piece of tissue provides plenty of DNA for PCR and restriction digests. Most importantly, collection of fish fin sample does not harm the fish. This is a very important consideration especially relevant regarding rare and the ornamental species. 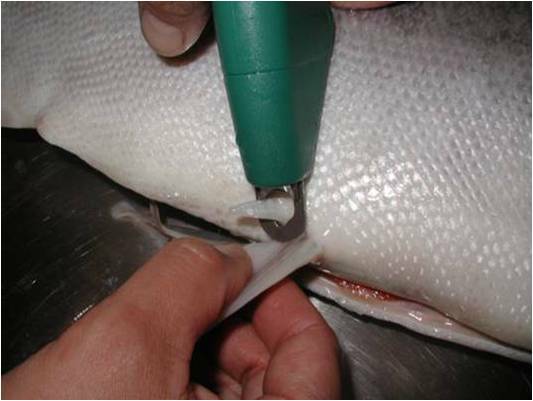 Fish fin samples are used for DNA-based studies on genetic diversity, mating systems and parentage determination of fish populations with minimal disturbance. The isolation of DNA usually begins with the lysis of cells or tissues inorder to destroy the protein structures and allows the release of nucleic acids from the nucleus. Lysis is carried out in a lysis solution containing important ingredients: sodium chloride which provides an osmotic shock to the cells; Tris HCl, which is a buffer to retain constant pH; EDTA, which sequesters the divalent metal ions that is required for nuclease activity and thereby inhibiting its action; a detergent, usually SDS, which disrupts the cell membrane and nuclear envelope, causing the cells to burst open and release their DNA. The DNA is still rapped very tightly around histone proteins. Proteinase K (a serine protease) is the common enzyme used in DNA extraction that cuts apart the histones to free the DNA and finally results in the breakdown of cells and dissolving of membranes. The nucleic acids are then purified from the protein- nucleic acid complex by phase extraction with a mixture of organic solvents namely Phenol, Chloroform and Isoamyl alcohol in a ratio of 25:24:1. Phenol dissociates proteins from DNA. Chloroform denatures the proteins and lipids and helps to maintain the separation of the organic and aqueous phase. It also makes the DNA less soluble in the phenol, thus reducing losses to the organic phase. Isoamyl alcohol is often added to prevent foaming. At pH 7-8, the DNA partitions to the aqueous phase while the protein is denatured and extracted into water- immiscible organic phase, which is separated from the nucleic acid containing aqueous phase by centrifugation. When large amount of protein is present, it forms a white precipitate between the organic and aqueous phase. The DNA is then precipitated with cold ethanol or isopropanol after adjustment with 3M sodium acetate and then centrifuging. The DNA is insoluble in the alcohol and will come out of solution, and the alcohol serves as a wash to remove the residual salts. The alcohol is then removed, and DNA is stored in a biological buffer, like TE (Tris-EDTA) buffer. Contaminating RNA in the DNA sample can eliminated by digestion with an RNase. However, since shearing forces are generated at every step, the resulting DNA molecules in the final preparation rarely exceed 100-150 kb in length. DNA of this size is adequate for Southern analysis on standard agarose gels, as a template in PCRs, and for the construction of genomic DNA libraries in bacteriophage λ vectors.